Happy Friday! It's time for me to check in and share another 30 Recipes In 30 Days update - if you missed the previous post in the series you can catch up here. First up was this colourful and easy-to-follow chow mein recipe packed full of vegetables from The Wanderlust Kitchen. Unfortunately my version didn't turn out quite as well as I'd hoped as I wasn't too keen on the gluten free noodles I used as a substitute. Next time I'll have to try out a different brand/variety! Buffalo Cauliflower seems to be one of the most popular vegan recipes over on Pinterest and it's been on my 'to try' list for so long I just had to include it in this challenge. There are so many different variations of the idea but I ended up following the Popsugar version, although I did also add in some gluten free breadcrumbs for extra crunch! The flavour of these was great, but I'd still like to try out some of the other versions. This is another recipe idea that's been on my 'to try' list for far too long! I actually ended up combining two recipes here, cooking the samosa filling from a Hairy Bikers recipe and looking to Klean Kuisine for tips on how to wrap using rice paper. Unfortunately I had a bit of trouble shaping the samosas into triangles as when I opened the packet of rice paper all of the sheets were broken, but they still tasted good! These green pea fritters are another recipe I found over at Wallflower Kitchen and I served them up for dinner alongside brown rice pasta with a lentil sauce. As I made a whole batch and Aimee's recipe said they were also a great falafel alternative I had some more for lunch the next day, this time with salad, seeds, yoghurt dip and pitta bread which was filling, healthy and delicious - what's not to like? 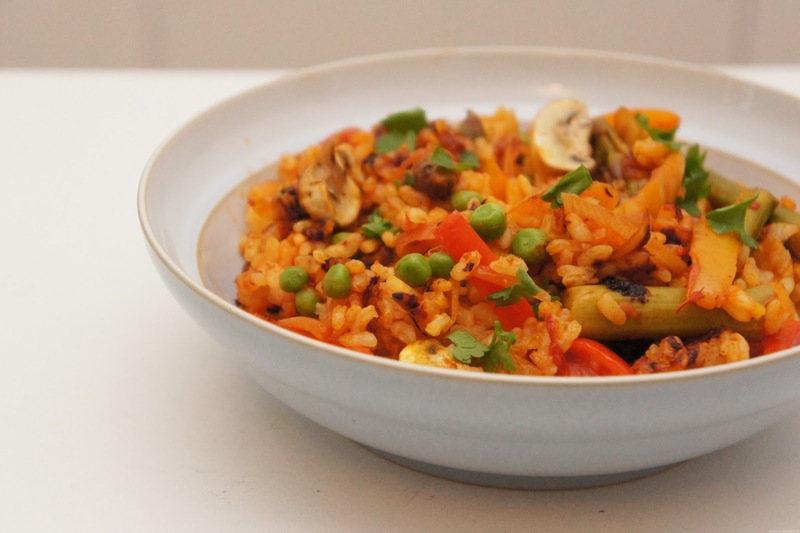 I'd been searching for a great veggie paella recipe for a while and this one from The Simple Veganista definitely fits the bill. With smoked paprika, chili flakes, garlic and lots of vegetables the finished dish had tons of flavour and I'm sure I'll be making it again soon!